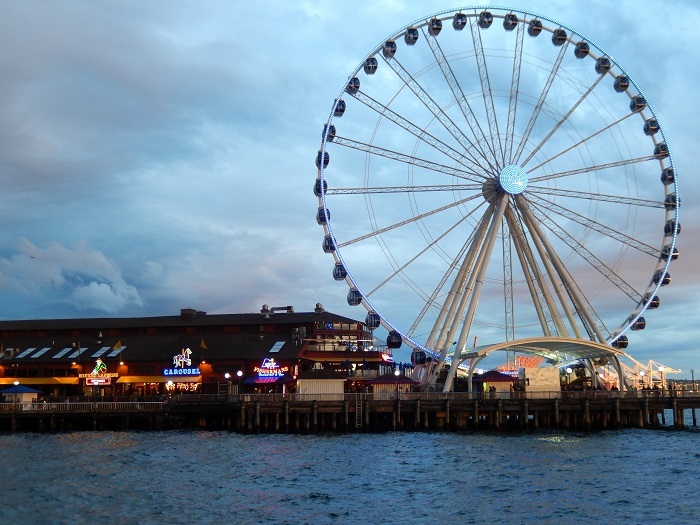 Opened in June 2012, the Seattle Great Wheel is a 175-foot (53.34-meter) Ferris wheel featuring 42 climate-controlled gondolas each holding up to six passengers. It is located at Pier 57 in the city’s Central Waterfront district. Photo Credit: Benjamin Mack/GALO Magazine. Before this article progresses further, it should be established that western Washington State is not America. Instead, it’s another world. But what world could it be, exactly? A vast swath of unspoiled country first inhabited by various Native American tribes; the picturesque setting that inspired the teen saga Twilight; or perhaps the location of many feature-length films, including Sleepless in Seattle? Or maybe it is the wettest place in the continental US? No, those would only be partially correct. The real answer: the North American version of the Garden of Eden. Far-fetched as it sounds, it’s true. Sculpted by the pounding, turbulent waves of the Pacific Ocean, the 157 miles (253 kilometers) of coastline Washington boasts — all of which is public land — is a true masterwork of nature. Look on any topographical map, and all one sees along the Washington coast is a solid, uninterrupted stripe of green bordering the immense blue of the world’s largest ocean. But as awe-inspiring as the coast may be, I wasn’t exactly flabbergasted by the prospect of taking in its breathtaking vistas on my most recent visit, at least not at first. Maybe it’s because I’m more or less from there (my hometown of Portland, Oregon’s largest city, is just a few hours’ drive away). Or maybe it’s because — as an adventure junkie — compared to places like rural North Korea, metropolitan Zimbabwe, or pretty much anywhere in Kyrgyzstan, the postcard-perfect little seaside towns and villages just don’t have the same exotic (and slightly dangerous) thrill as those places that also happen to be under U.S. State Department travel warnings. Yet such feelings soon fell by the wayside as the evergreen and deciduous trees of Oregon’s Clatsop State Forest whizzed past, which reminded me of a time when the tallest things people knew of were trees and automobiles were considered a luxury. The drive on U.S. Route 26 through the Oregon Coast Range — a small mountain range between Portland and the Pacific which averages 30 to 60 miles (48 to 97 kilometers) wide and around 1,500 feet (460 meters) in elevation, and is among the wettest places in North America with average annual rainfall exceeding 120 inches (300 centimeters) in some areas — is one of the most underrated road trips in America; a portal to an ethereally green land of picturesque waterfalls and cozy coffee shops, restaurants and lodges tucked under the boughs that makes one wonder why Hollywood hasn’t come calling more often. I was with my best friend John, a man who I hadn’t seen in two years but who I considered closer even than family. He and I would Skype constantly — sometimes for up to eight hours at a time — but seeing him again made me realize that technology can never replicate actually being with a person. As we would so often do when we were together, our reunion required an adventure and a two-day road trip to Seattle by way of the Olympic Peninsula promised just that. Or so we hoped. Turning onto US 101 — the coastal highway that stretches all the way from Los Angeles to Washington’s capital of Olympia — we headed north, passing through Astoria (the filming location for such flicks as The Goonies, Kindergarten Cop, The Ring 2, Teenage Mutant Ninja Turtles III, and even parts of Twilight) and over the Astoria–Megler Bridge, a steel cantilever truss bridge opened in 1966 that spans the mouth of the gargantuan Columbia River and, at 4.1 miles (6.6 kilometers) long, is the longest continuous truss bridge in North America. Our car temporarily stopped near the center of the two-lane bridge due to construction (a five-year $50 million repair job is due to be completed in December 2016), the view was unlike almost anything I’d seen before: sea and sky combining in a swirl of shades of blue, streaked with a green that was greener than a mint green crayon. Rather than skyscrapers rising all around us, there was only nature. For the first time in my life, I was jealous of construction workers who were fortunate enough to spend hours gazing upon such a sight. Heading north, we found ourselves in the Olympic Peninsula, the westernmost point in the contiguous United States (closer to Tokyo than it is to London) and home to temperate rainforests including the Hoh, Queets, and Quinault. Contemporarily, the area has also gained fame as the primary setting of Stephenie Meyer’s Twilight series. With cloudy skies more than 300 days per year, it’s indeed the perfect place for sun-averse vampires to call home. If Oregon was greener than shamrocks on St. Patrick’s Day or the costume of comic book character Green Lantern (a fitting metaphor considering the popularity of comics in the Pacific Northwest), then the Olympic Peninsula was beyond the imagination’s comprehension. Green in all shades — from a dark tint that was almost black to bright hues that nearly required sunglasses to see — ringed the two-lane highway, over which little clouds of mist hovered, their tendrils like the wisps of the arms of ethereal ghosts. It was, naturally, cloudy overhead, but mercifully not raining buckets as is apt to happen in the area. Nibbling on packed trail mix energy bars (a combination of dried fruits, like raisins and cranberries, mixed with peanuts and chocolate, and bound together by some unknown substance), we made our way through the port towns of Aberdeen and Hoquiam — areas dominated by the timber and fishing industries, and as blue-collar as any in America as a result — to the Quinault Rainforest. A glacier-carved valley formed by the Quinault River and Lake Quinault, the forest is called the “Valley of the Giants” because of the number of large tree species it contains. Some of the largest specimens of Western red cedar, Sitka spruce, western hemlock, Alaskan cedar and mountain hemlock in the world are there, as well as five of the ten largest varieties of Douglas fir. In fact, it has the largest collection of giant trees outside of California’s Sequoia National Park. Exiting the little red car affectionately dubbed “Amelia” (an homage to both the Doctor Who character and the hulking turquoise 1996 Dodge Caravan known as “Bertha” I’d once owned, and which had previously been the vehicle of choice for our adventures), we felt like Gulliver in Brobdingnag. These trees weren’t just tall — they were massive. Ours being the only vehicle in the parking lot, many of the trees had a trunk diameter greater than that of fire engine red, two-door Amelia. Some buildings — even in a large city — were smaller than these trees. I had never seen such huge living things. Further, to think that some of these trees were hundreds of years old — existing long before the United States was even colonized — was mind-boggling. Paying the $5 day-use fee by leaving money in an envelope that was dropped in a small wooden box in exchange for a flyer to put on Amelia’s windshield, we began hiking on a nearby trail; like on the highway, clouds of mist hung low all around us. Moss carpeted practically every conceivable surface: craggy rocks, the trunks of those giant trees, and even the trail itself. It was so soft and squishy, like walking on a home carpet after a large amount of water had been spilled on it. Even though it was late June, it was still cold enough to require a jacket. The air was so laden with moisture, we were soaked within a few minutes — despite the fact that not a single drop had fallen on our heads. Making our way through the forest, we came to Lake Quinault, a 3.8 mile (6.1 kilometer)-long body of water whose glassy surface reflected the sky and surrounding trees better than any HDTV. Receiving an average of 131.07 inches (332.92 centimeters) of rain per year, the lake is chock-full of a variety of fish, from salmon to trout. Cougars, black bears, coyotes, bobcats and more all stalk the shores as frequently as human fishermen, meaning it’s best to watch your back, in case one of these large mammals happens to hanker for a decidedly drier prey. Thankfully, we didn’t encounter any such creatures (or sparkling vampires, for that matter) and, after taking in the view and continuing our discussion that hadn’t ended since we’d left Portland, made our way back to Amelia to continue our journey. “Every interview he does has a certain Theatre of the Absurd quality to it,” I remarked, offering my views on the current topic John and I were discussing, controversial Internet/broadcast personality and conspiracy theorist Alex Jones and his belief that global warming and deforestation is a myth. “Remember that BBC interview where the host called him the worst interview subject ever?” John asked.